Compromised quality can erode margins through unnecessary support issues and defection of customers to other providers. Amidst an increasingly crowded stage of new video sources, new viewing devices and rapidly evolving network architectures, SSIMPLUS™ Live Monitor addresses the industry’s need for a unified end-to-end system that analyzes and informs optimization to viewer experience and delivery efficiency – regardless of the infrastructure and display. Built for scale, this software enables operators to simply and cost-effectively create a unified, end-to-end monitoring environment for QoE, QoS and regulatory compliance. 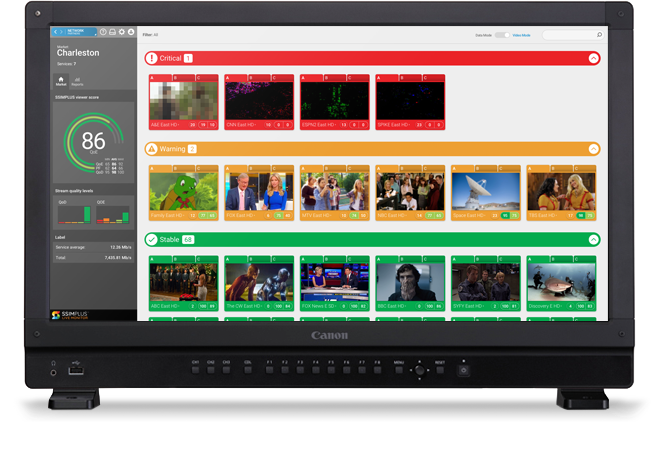 Designed for digital by Emmy Award winning researchers, SSIMPLUS Live Monitor delivers viewer-first real-time monitoring of input and output video quality including audio at every stage of the delivery ecosystem. SSIMPLUS Live Monitor provides a clear view of any potential problems—including root causes, frequency and solutions—often before subscribers notice them. SSIMWAVE's measurement standard represents a generational breakthrough in the video industry. The Television Academy, 67th Primetime Emmy Awardfor significantly impacting television technology and engineering. SSIMWAVE's SSIMPLUS™ platform is by far the best device-adaptive perceptual video quality predictor we have seen in the market. SSIMPLUS Live Monitor uses computationally efficient software-based probes to monitor video and audio quality at all five points in the content ecosystem, including: Source; Encoding and Demux Output; Aggregator Output; Delivery Across the Demarcation Point; and Playout by End-User Devices. Importantly, SSIMPLUS Live Monitor is alone in offering the industry’s first real-time independent monitoring of encoders, allowing operators to secure the weakest link in the current ecosystem. What is the service and stream level infrastructure performance from a viewer experience and regulatory conformance status? Where did the degradation happen? When did the degradation happen and how frequently? Why did the degradation happen? Subscription-friendly solution provides flexibility between OPEX:CAPEX spending. Complex algorithms and big data meaningfully presented for executives to make critical business decisions and engineers to identify and fix quality problems. A scalable metric is required across all aspects. Existing video quality metrics do not account for impact of transformations on perceptual video quality. SSIMPLUS Live Monitor is a software based solution that deploys on commercial off-the-shelf hardware. Run a single instance on a single server or scale to multiple instances on a cluster. Video codecs H.264/AVC/AVC-Intra/XAVC, H.265/HEVC, MPEG-1, MPEG-2, MPEG-4. Audio codecs PCM Audio (WAV/AES/BWF), AAC, HE-AAC, Dolby Digital (AC-3), Dolby Digital Plus (EAC-3), MPEG-2 (L1,2,3), MPEG-1 and IEC61937 (AC-3). Captions and Subtitles CEA-608/CEA-708 in Line 21 video. Ad-insertion SCTE35 Type 5, SCTE35 Type 6. Container Wrappers M2V, M4V, MKV, MOV, MP4, MPEG, MPG. Display Device Adaptive Video QOE Monitoring TV, Tablet, Phone, Monitor, Laptop. Download the product sheet, request a trial or talk to a representative.